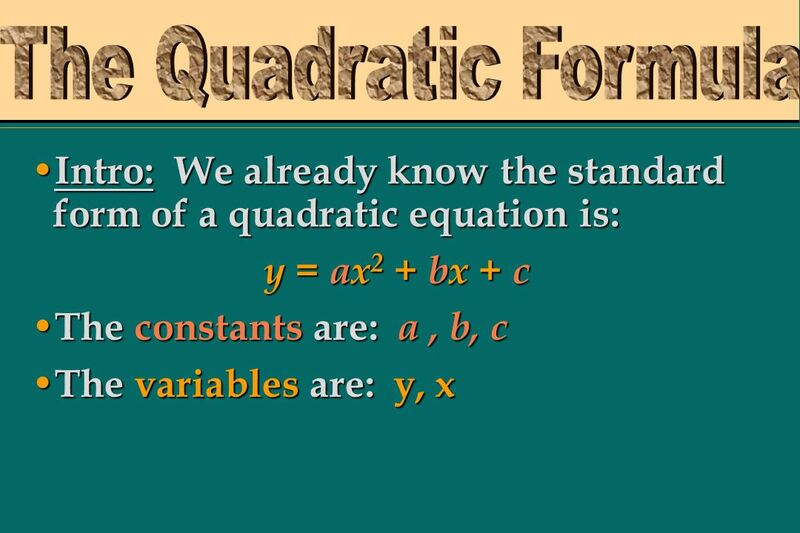 Intro: Intro: We already know the standard form of a quadratic equation is: y = ax2 ax2 ax2 ax2 + bx bx + c The The constants constants are: a, b, c The. 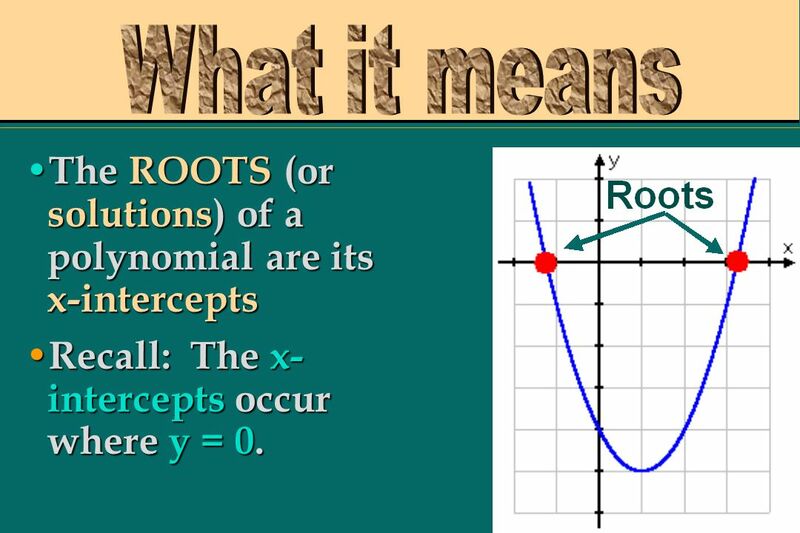 3 The ROOTS (or solutions) of a polynomial are its x-intercepts The ROOTS (or solutions) of a polynomial are its x-intercepts Recall: The x- intercepts occur where y = 0. Recall: The x- intercepts occur where y = 0. 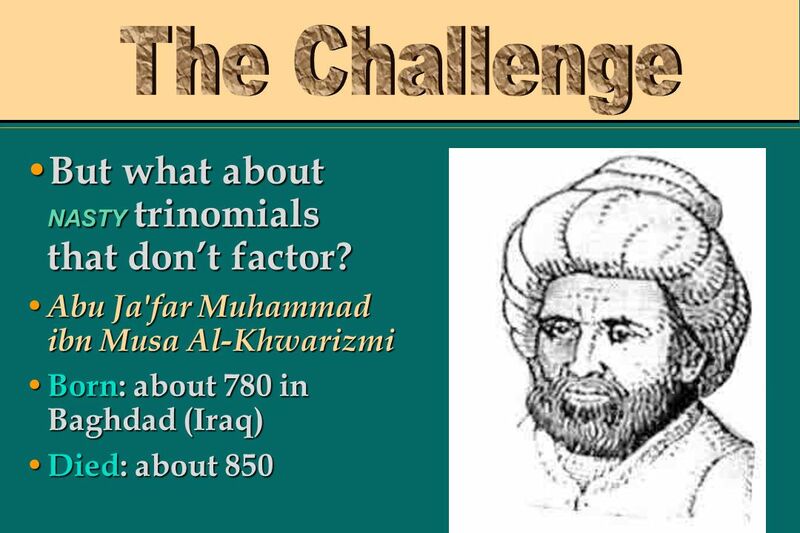 6 After centuries of work, mathematicians realized that as long as you know the coefficients, you can find the roots of the quadratic. Even if it doesnt factor! 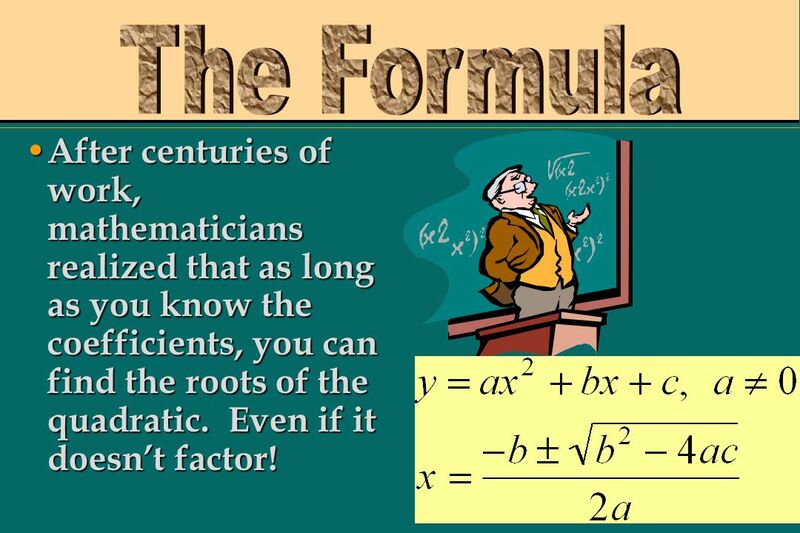 After centuries of work, mathematicians realized that as long as you know the coefficients, you can find the roots of the quadratic. Even if it doesnt factor! 9 Plug in your answers for x. 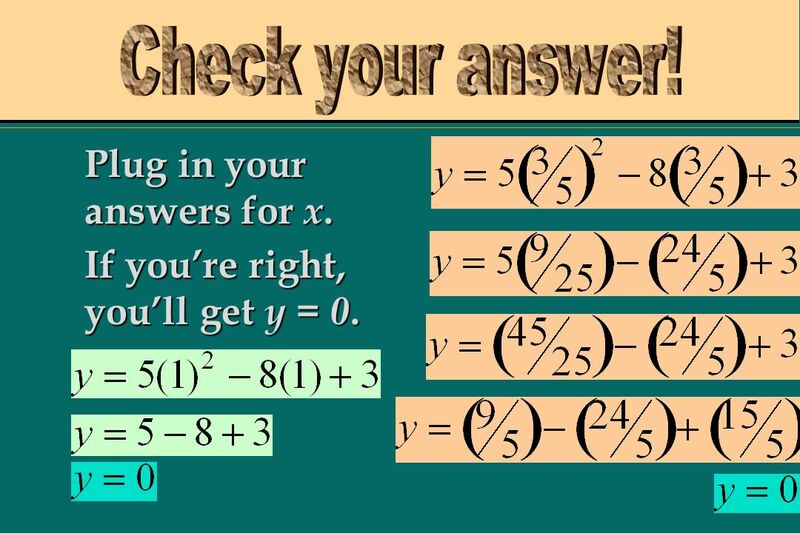 If youre right, youll get y = 0. 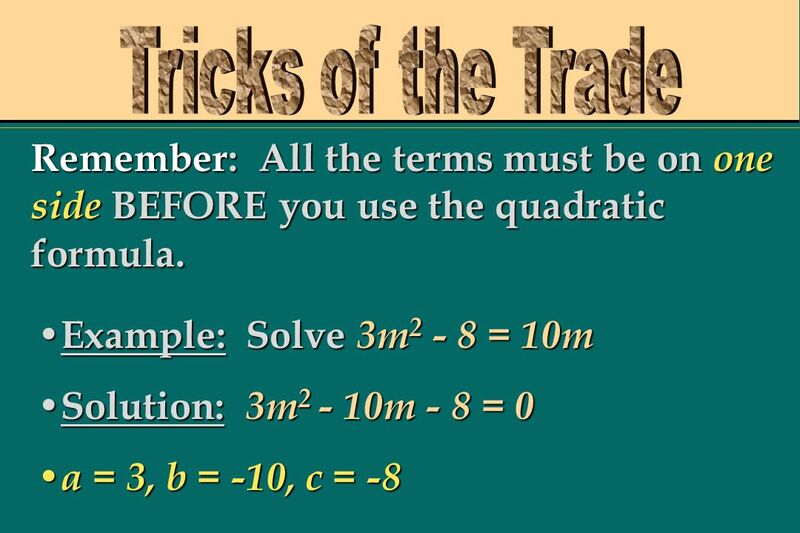 13 We use the quadratic formula to solve second degree equations. Mathematicians tried for 300 years to solve higher-degree equations until Niels Abel (top picture) proved that no formula can be used to solve all fifth-degree equations. He was 22! Evariste Galois (bottom picture) showed that there is no universal formula for any equations higher than the fourth degree. When Galois was 20, he wrote in ONE NIGHT much of the basis for a new theory of solving equations. Sadly, he was killed in a duel the next day. Evariste Galois (bottom picture) showed that there is no universal formula for any equations higher than the fourth degree. 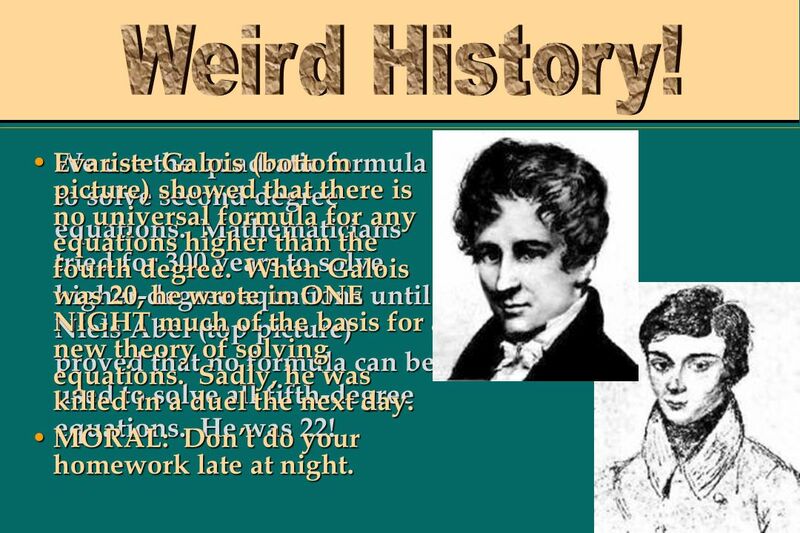 When Galois was 20, he wrote in ONE NIGHT much of the basis for a new theory of solving equations. Sadly, he was killed in a duel the next day. MORAL: Dont do your homework late at night. MORAL: Dont do your homework late at night. 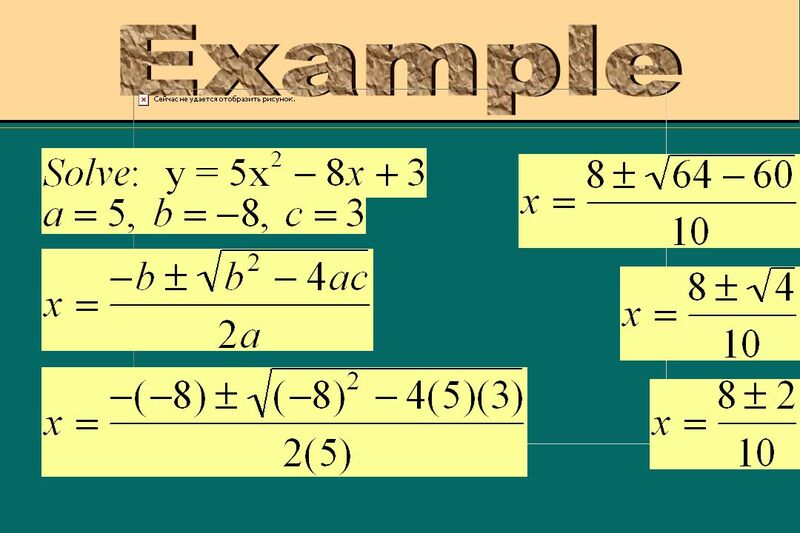 Download ppt "Intro: Intro: We already know the standard form of a quadratic equation is: y = ax2 ax2 ax2 ax2 + bx bx + c The The constants constants are: a, b, c The." 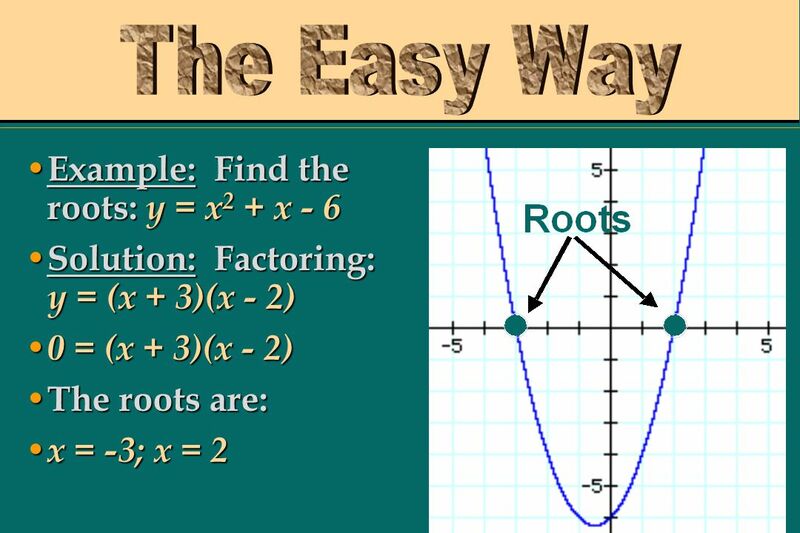 Solving polynomial Equations in Factored Form MM1A2f: Goal: solve polynomial equations Factor trinomials of the form x2 +bx +c. 2.4 Completing the Square Objective: To complete a square for a quadratic equation and solve by completing the square. 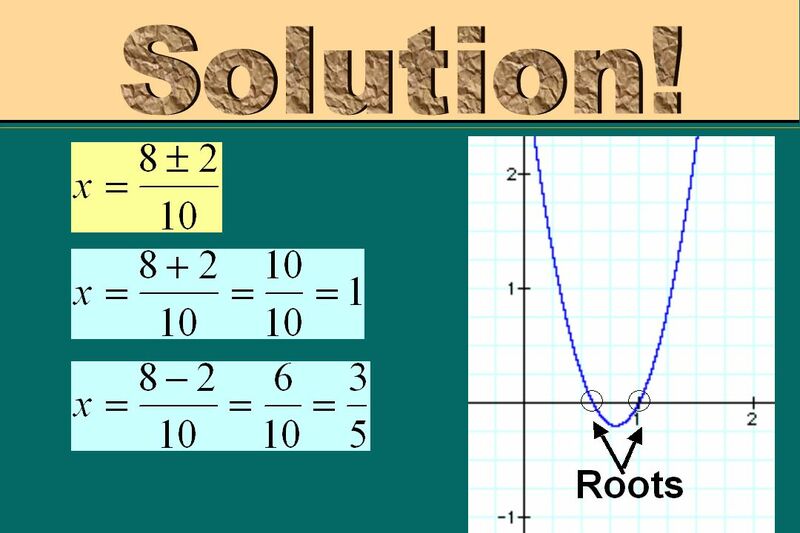 Solving Quadratic Equations Algebraically Lesson 2.2. Objectives: 1. Solve equations by: A. Factoring B. Square Root of Both Sides C. Completing the Square D. Quadratic Formula 2. 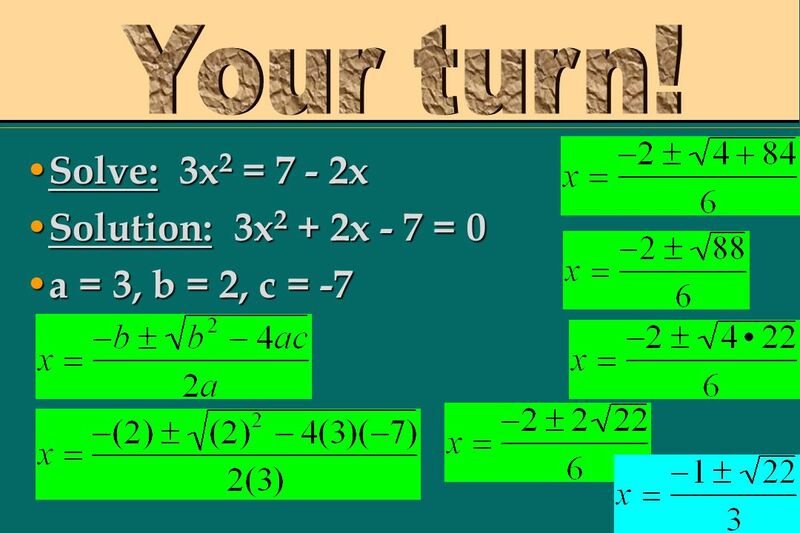 Solve equations in quadratic. 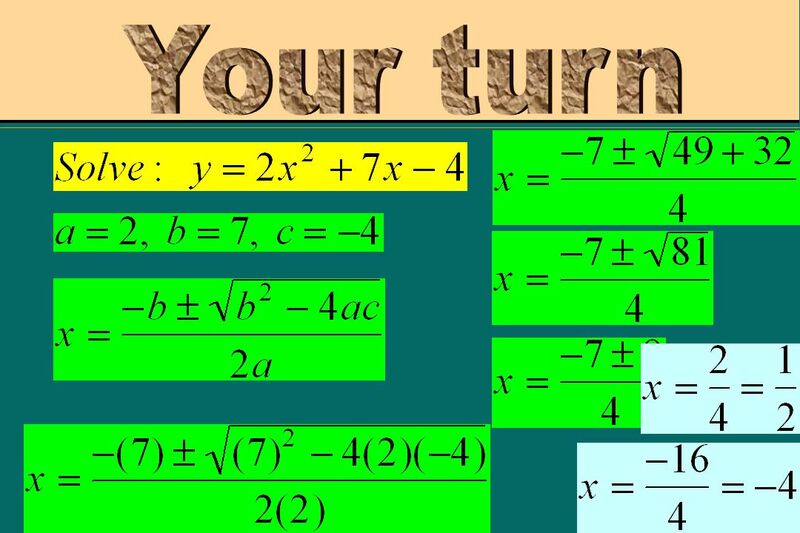 Completing the Square Perfect Square Trinomials: Factor: This is called a perfect square trinomial because the factors are the same. So we can rewrite. + Completing the Square. + In your notes: Simplify the following: (5 – 3i)(4 + 2i) 3. 1.7 Completing the Square Objective: To complete a square for a quadratic equation and solve by completing the square.